Our company was established in 1993 in the central part of Russia, since that, we have been concentrating on making and promoting top quality lacquer art, both modern and vintage. We have been trying to keep the ancient complicated techniques and traditions of old Russian icon painting and combine them with Japanese ways of using the lacquer and maki-e.
During almost 20 years we were very carefully selecting and building our direct relations with the best painters who studied 5 years in the State schools of Palekh, Fedoskino and Mstera art. All of them have their masterpieces in numerous private collections in USA, Great Britain, Singapore, China, Germany, Italy etc. and in the State Museums: Moscow Decorative and Applied Art Museum, Palekh State Museum of Art, Ivanovo State Museum of Art, Museum of Russian Art, Minneapolis, USA - just to name a few. We have done many projects with well known Italian pen makers Ancora (nearly all the Limited editions) and some with Aurora and Japanese Sailor. And starting from 2010 decided to make our own brand Artus -limited edition and one of a kind fountain pens, concentrating on quality of all the materials used, including the best possible nibs; customer care and ideas of International arts being presented on unique writing instruments. Many efforts have been done to receive very positive feedback and attention of a group of dedicated collectors during the Pen Shows in San-Francisco, USA 2011; Los Angeles, USA 2012, 2013; Maimi, USA 2012 and we are constant participants of Washington DC, USA pen shows. 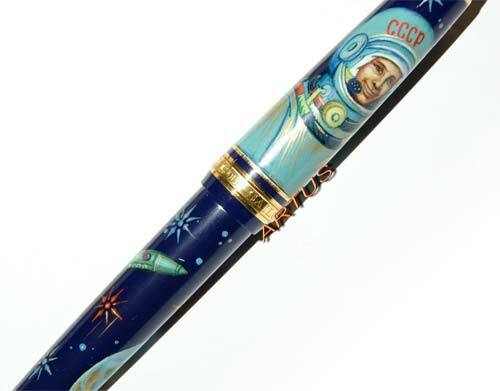 Artus pens participated in Russ Orthodox exhibition in Manegh Exhibition hall, Moscow, Russia in November 2012. We are proud that one of our first Artus Sailor LE model "Gagarin-First Man in The Space", was located into the new book by the famous collectors and experts in the fountain pens world - Masa Sunami and Andreas Lambrou "Fountain pens of Japan, 2011". Quite an interesting article was published about Artus pens in Pen World Magazine in August 2013 and we have been nominated for the Artus fountain pens Limited Edition "Storks-Symbol of Longevity" as the Best Artistic Pen of The Year among 20 participants and later received an Award as the Best Artistic Pen of The Year 2013 among 5 nominees! We are pleased to inform you, that the Artus Tropical Fishes has been nominated for Best Fine Art Pen in Pen World's 2014 Readers' Choice Awards. And second time readers voted from the ballot for Artus pen model (there were such companies as Namiki, Krone, Kynsey etc among the nominees)!!! Pen show in Los Angeles, CA, USA in February 12th-17th 2014 went well and quite an attention was paid for Artus exclusive pens, check fpn forum for reports! 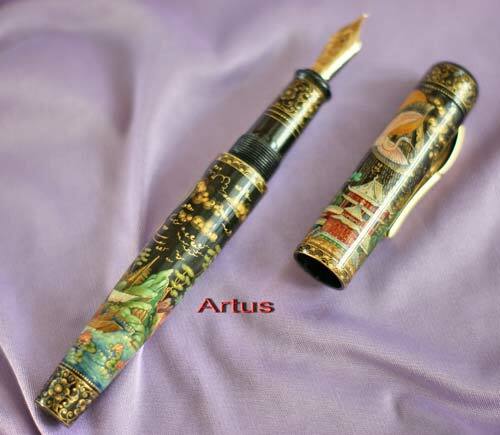 Artus pens participated in the exhibition of Russian lacquer art in State Museum of Decorative and Applied Art, Moscow in November 2013-February 2014, Artus set of Magnum Emperor pen and pen case "Window to Europe" was chosen to be published in the exhibition catalogue. - Artus pens were exhibited during the Madrid pen show, Spain 14th-16th November 2014 and in Paris Pen show on 23rd of November 2014! - Artus pens participated in 37th Antique Salon, Moscow, Central Painters House, 18th-26th October 2014 (press zone)! We are pleased to inform you that Artus has received three nominations in Pen World's 21st Annual Readers' Choice Awards: the Mozart Marriage of Figaro was nominated for Best Cultural or Literary Theme, the Napoleon for Finest Tribute, and the King of the Desert for Best Fine Art Pen. - Artus pens were exhibited for the forth time during the world largest pen show in Washington DC, 13th-18th of August, 2015. Artus pens with largest possible N8 nibs with ebonite feeder installed were demonstrated and received very good response among collectors. Hope to hear from you soon as well! - Artus pens were exhibiting for the first time in Hong Kong and Singapore during the tour of 16th-24th of September, 2015. - Artus pens has participated again in the 40th All Russia Antique and Fine Art Salon, Moscow, Russia, Central House of Painters from March 25th till April 3rd, 2016! - Artus participated once again in the largest DC International Pen Show, USA from August 3rd till 7th, 2016! - Artus pens were exhibited during the promotional tour in Dubai, UAE from 21rst till 30th of September, 2016! - We were exhibiting already for the 6th time during the most important cultural fair of Russia - 41rst Russian Fine Art & Antiques Salon, Moscow, Central Painters House from October 13th till 23rd, 2016! - Artus pens were exhibited for the sixth time during LA International Pen Show, CA, USA from February 15th till 20th, 2017! - We have been exhibiting already for the 7th time during the most important cultural fair of Russia - 42nd Russian Fine Art & Antiques Salon, Moscow, Central Painters House from March 24th till April 2nd, 2017! - Artus pens participated for the first time in prestigious ST. PETERSBURG FINE ART AND ANTIQUES SALON, Russia in Mikhailovsky Palace from 21rst till 24th of September 2017! - Artus pens participated again in prestigious MOSCOW Fine Art and Antiques Salon (Fair), Russia, Moscow, Central Painters House from October 14th till 22nd, 2017! - We participated again in LA International pen show, LA, USA during February 15-18, 2018! - We are pleased to inform that we exhibited again during the Washington DC International Pen show, USA - the largest pen show of the world! It took place during July 1rst-6th, 2018! - We made a European tour of pen showings in Germany, Dusseldorf and Cologne, January 12th-15th, 2019; Holland, Amsterdam, January 9th-12th, 2019! - Artus pens participated again in second largest pen show worldwide - LA International Pen Show 2019, LA, CA, USA from February 13th till 19th, 2019! - We were exhibiting for the 10th time during the most important cultural fair of Russia - 45th Russian Fine Art & Antiques Fair, Moscow, Central Painters House from March 5th till March 10th, 2019! Like Artus pens on Facebook to get free trackable shipping during 2019!